You are here: Home › Home Ownership › What If I Pay $100 Extra On My Mortgage? ← When Is Life Insurance Taxable? Paying off the mortgage is a great goal to have, especially if you have a 30 year mortgage. On my $116,000 mortgage paying an extra $200 per month put me on track to cutting my mortgage duration in half. Because 30 year mortgages are mostly interest payments for the first decade paying even a small amount extra on principal can greatly reduce how long you will have the mortgage payment for. 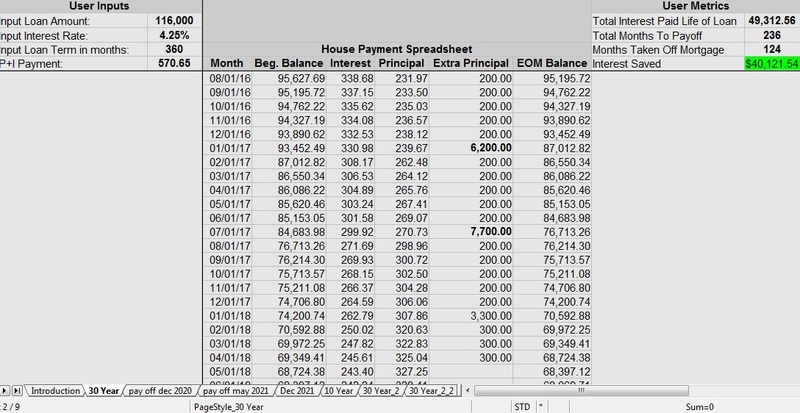 I’ve been asked by multiple readers “What if I pay $100 extra on my mortgage?” I have used my mortgage payment spreadsheet to calculate what happens if I pay $100 extra on my mortgage in dozens of different situations. Many people argue that it doesn’t make sense to pay extra on your mortgage and you should instead invest the extra money instead. I greatly disagree with this and think you should do both investing for retirement and paying extra on your house at the same time, the goals go hand in hand. I recommend reading this Dave Ramsey article on Why you should pay off your home early if you are unsure about paying extra on your mortgage, especially if the tax deduction is your motivation for keeping a mortgage. There are 3 main variable in this situation: How far into the mortgage amortization you already are, what your interest rate is, and what is the loan value amount. For this chart I am using a new mortgage and I used an interest rate of 3.5%, 4.5%, and 5.5% with mortgage values ranging from $50,000 to $300,000. Early in a mortgage amortization the overwhelming majority of the loan payment is interest. For example, a 30 year 4.5% loan of $100,000 will have $375 going towards interest and only $132 going to principal repayment. The lower the mortgage balance is the more drastic paying $100 extra on your mortgage is. The higher the interest rate is the greater effect paying $100 extra makes as well, although this variable is relatively small in relation to the size of the mortgage. For someone with a $50,000 mortgage paying $100 extra each month can pay off their home a full 13 years early with a 5.5% interest rate! Higher mortgage amounts can still put a sizable dent into the term of their loan with only $100 extra per month. Starting early in the amortization is the key to success with paying extra on your mortgage. Taking 4 years off of a $275,000 mortgage with only $100 extra per month looks like a win to me. With a 15 year mortgage you are already paying an extra $100 or more dollars per month to cut the length of the mortgage in half. Because of this the effects of adding extra principal payments onto a 15 year mortgage are not nearly as drastic as paying $100 extra on a 30 year mortgage. On The $50,000 loan instead of taking 13 years off like it did on a 30 year mortgage paying $100 extra on your mortgage per month will only take off 4 years, however that makes the total loan only 11 years instead of the 17 years when starting with a 30 year mortgage. 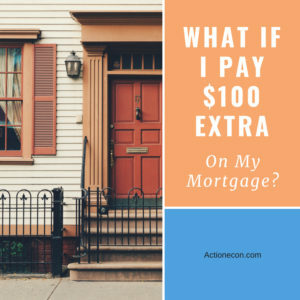 What If I Paid $200 Or More Extra On My Mortgage Per Month? Keep in mind that paying $200 instead for $100 will not double the time taken off of your mortgage. Here is a chart using new 30 year mortgages at 4.5% that shows how much time different amounts of extra principal payments will take off your mortgage and the amount of interest saved over the life of the loan. If you really want to knock out your mortgage quickly it takes a lot more than $100 a month. I started paying $100 extra on my mortgage about 3 years into my mortgage, which causes the numbers to be different from starting right at the beginning. After a few months I increased it from $100 a month to $200 per month and now I currently pay $300 per month extra on my mortgage plus a large payment at the end of each year. To calculate changes like these you need to use my mortgage planning spreadsheet to find out exactly what paying $100 extra on your mortgage will do to shorten your term and save you on interest expense. I track mine every month and I am able to see in real time how many months I have taken off of my mortgage and how much interest I have saved. My mortgage planning spreadsheet is available for download by clicking this button. Okay so everyone wants to pay at least an extra $100 a month of their mortgage, but how do we come up with that extra hundred bucks? From an income perspective here’s what I think most people can do, remember $100 a month is about $3.30 a day. 2.5 hours per week at $10 an hour: Just grab a few extra hours at your normal job or pick up a structured job. I often see ads for commercial building cleaning positions that are usually 1 night a week for 2 – 5 hours, this is the perfect job to throw extra on the house. 5 hours a month driving for Uber. If your car is nice enough to qualify and you like meeting new people this is a great way to make a few extra bucks. 7 hours a month delivering groceries with Shipt. I see Shipt shoppers all the time at my local grocery store. You can choose when you want to work and in addition to what the app pays you people often give tips. 20 hours of babysitting in the evenings or weekends: Bonus, take on 2 or 3 kids at the same time and the time it takes to earn a hundred bucks drops. Mow 5 lawns at $20 a pop, usually taking 20 minutes a piece. Granted in most areas you lose 3 to 5 months of the year to winter, but paying an extra 100 on your mortgage for 7 months is a lot better than 0 months! Rent out an extra room: Make the house pay itself off! Even in inexpensive markets you should be able to rent out a single room for $400 a month. Subtract out $50 a month to cover increases in utility costs and you can throw $350 extra per month on your mortgage. If I didn’t have the discipline to actually pay $100 extra on my mortgage every month I would refinance my loan to a shorter term with LendingTree.com . The ability to make a change once and not have to worry about it again is very appealing, and you may be surprised at how low closing costs on a refinance can be. When I refinanced my rental house between the interest saved and the lower monthly payment the refinance paid for itself in under a year. So far I haven’t had any issues with skipping payments for convenience or cash flow issues. I set up my bank to automatically transfer the money to my loan so I don’t have to think about it. Do you pay any extra on your mortgage each month? If so how do you track how it changes your payoff date and interest saved? One Response to "What If I Pay $100 Extra On My Mortgage?" I used to add hundreds of dollars to my mortgage payment each month when I got my first mortgage and slowly dropped it down as money got tighter, but still always at least rounded up to the a nice round number. Since it was a 30 year mortgage, it definitely helped build up the equity so when we sold that house we already had the down payment for the new house as opposed to just losing it all in closing costs. Now I’m not a 15 year mortgage and just making the requirement payment while focusing on debt payments, but I can’t wait to throw more at the mortgage each month.